, long legacies of disinvestment in schools and communities, unequal access to high quality or culturally responsive teaching and learning, and school climates that dehumanize and deprioritize relationships with youth of color. Despite knowing the historic and current reality of how race has shaped our country and schools, as a state, we shy away from addressing race and racial inequality head-on. In California, 1 in 5 Latinx students does not graduate with his or her class and for Black students that number is 1 in 3. 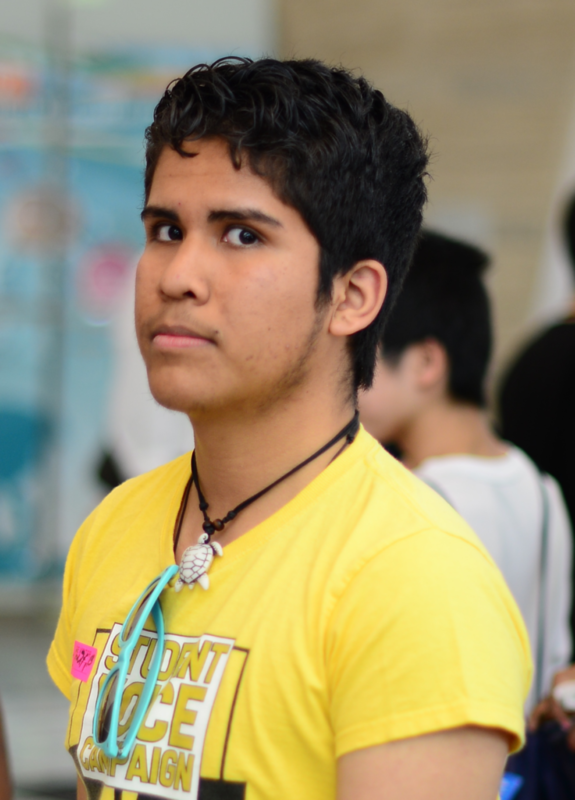 Young people like Hector continue to face racial inequality in and out of school. Black, Latinx, Southeast Asian, Pacific Islander, Filipino, Middle Eastern, North African and Native American students still find themselves separate and unequal -- systematically shut out of opportunities for generational success and prosperity. Generations of students of color are funneled into the school-to-poverty, school-to-deportation, or school-to-prison pipelines. This current educational context cannot be divorced from centuries of deeply rooted systemic racism - the historic, economic, sociopolitical policies and forces that have systematically deprived students of color of a quality education. The intersecting systems of criminal justice, immigration, housing segregation, and income inequality can both be reinforced, and altered by what happens in our schools. At this moment, we have the opportunity to transform public education and break the cycle of racial inequality. Together, we have made real progress by boldly pushing for equity to hold and uplift all of California’s young people. Now is the time to build on this momentum and lead together to create the racially just schools our youth deserve. Black students continue to struggle in almost every academic category regardless of family income. Students of color are disproportionately represented in suspensions, special education, and foster care. Pacific Islanders, Filipinos, and Southeast Asians report lower expectations from school staff and stereotyping as failures or gang members. We must center race in our words, in our actions, and in our policies to truly address the inequities students of color face in today’s schools. 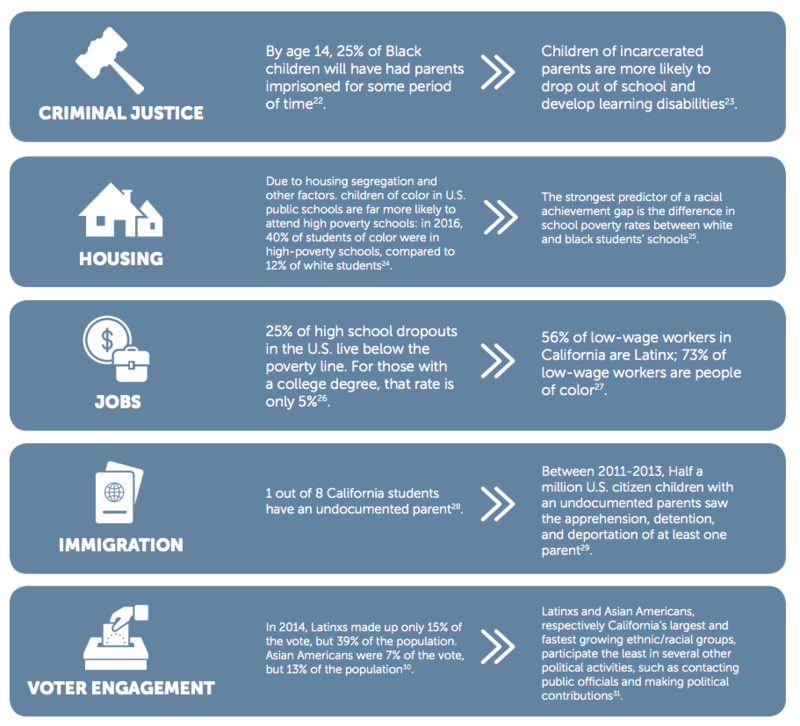 Californians for Justice recognizes the critical role education plays in the lives of young people and families. Access to a quality education gives young people an opportunity to succeed, thrive, and realize their dreams. To truly advance racial equity in our schools we must acknowledge how race and racism play key roles in shaping the experiences of young people on three levels – institutional, interpersonal, and internal. Increased funding for California schools. As White families have opted out of public education, interest has declined among politicians and voters (the majority of whom are White) to get California higher than 46th in the country in per student funding. We need to fix Prop 13, which has led to decades of underfunding schools for low-income students of color. We must implement strategies that diversify our school boards, educators and administrative leader workforce. This is especially important in California, where 80 percent of teachers are white, and 75 percent of students are youth of color. We need to replace our current outdated model of education with models that center race and relationships as the key for students of color to thrive. Since its beginning, our education system has been based in a “factory model” design that is no longer relevant to the young people of today. We've had a one-size-fits all model of education for over 100 years and now need an education system that is organized around student’s racial identities, needs and experiences. 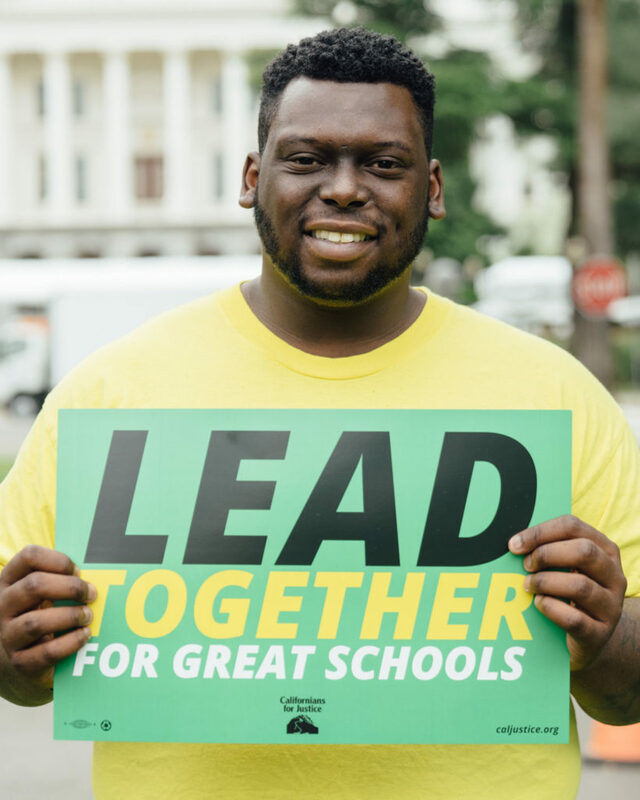 Relationship Centered Schools provides a path toward a holistic education system that meets the needs of all students, regardless of their race or zip code. Improving school climate and confronting implicit and explicit racial bias. Research shows that school staff have lower expectations, and are more likely to stereotype students of color. A Stanford University study found that Black students are more likely to be labeled as troublemakers. All school administration, teachers, and support staff should participate in annual implicit bias and restorative justice trainings so they may continuously learn about how race affects the experience of students and their colleagues. According to the California Healthy Kids Survey, 1 out of 3 students cannot identify a single caring adult on school campus. Young people like Hector and Karla often internalize low expectations – especially when the lack of caring adults is accompanied by a lack of resources to succeed in school. We can challenge internalized racism by building relationships where students feel they belong, are encouraged to do their best, and have teachers that deeply care about who they are, and their potential. We must go beyond just listening, and embrace truly valuing students by reflecting their ideas in the decisions we make. Learn more about our Relationship Centered School's advocacy here.